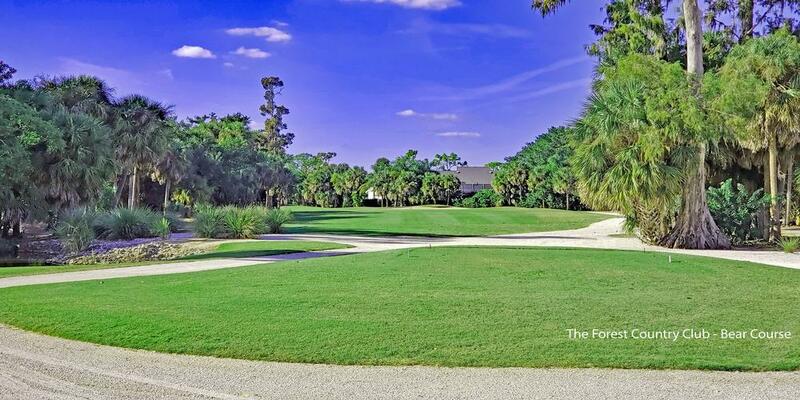 Since opening its doors in 1979, The Forest Country Club has strived to offer its Members quality, integrity and value as one of the premier clubs in the Fort Myers area. 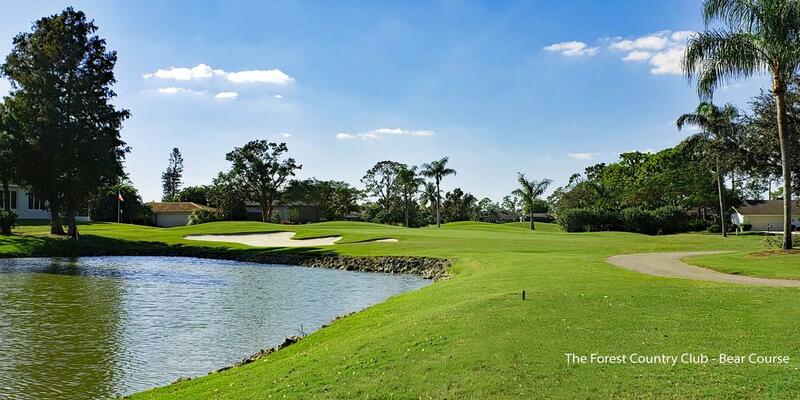 The Forest is a family oriented, private country club that is member-owned and features two meticulously maintained, 18-hole Gordon Lewis-designed championship golf courses that are recognized as some of the most beautiful - and challenging - in the area. The Bobcat and The Bear golf courses share several common characteristics and will leave you with many lasting memories. As you make your way around both layouts, you'll encounter fairways lined with oak, palm and Cypress trees, some over 100-years old. You're also likely to encounter all kinds of wildlife, from alligators to bobcats to bald eagles. There's a lot of penalty areas in the form of lakes, ponds and streams to contend with as well. The beauty, design and impeccable conditioning of each course will present a challenge each time you play. Both courses have been renovated over the past few years and have the look and feel that will match any facility in the area. Since it opened in 1980, Forest Country Club's acclaimed Bear Course has exceeded the expectations of anyone who has set foot on the first tee. 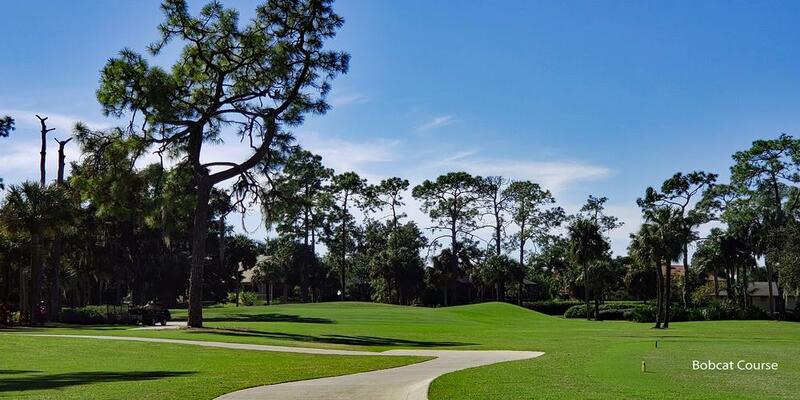 The Bear has hosted a number of prestigious events including a U.S. Open Qualifier and more than 16 FSGA events including the Florida Match Play Championship. GOLFWEEK Magazine has gone so far as to rank The Bear as one of Florida's Top 25 Most Distinctive Courses. Of the two courses, The Bear is considered to be more of a challenge although with five sets of tees, you can make the course as challenging and enjoyable as you like regardless of your skill level. Ranked as the hardest hole on the back side, Number 11 is certainly one of the most interesting and challenging on the entire course. Accuracy and distance control are a must off the tee; the shot requires a slight carry over a waste bunker area on the left side. Too far left off the tee and you may find the lake that cannot be seen from the tee. Hit it too far up the right side and you may find a lake #2. A third lake comes into play on the layup and approach shots on the left; there's a lot of mounding around the green on that side as well. A trio of bunkers guarding the right side of the green eliminates that as a bailout option. You can see why par is considered a good score here. 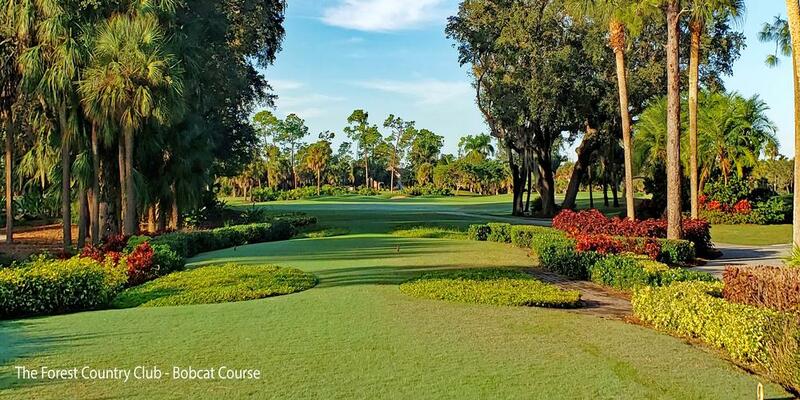 The Bobcat Course was renovated in 2015 by Lewis' firm with two goals in mind: improve the aesthetics and playability of the course and reduce water usage substantially through better use of reclaimed water. Forest Country Club has done a great job of addressing the aesthetics and playability aspect goals. New tees have been built; many of which are much larger. Both the tee boxes and fairways have been regrassed with Celebration Bermuda grass. Putting surfaces have been brought up to USGA standards and regrassed with TifEagle Bermuda grass. Bunkers have been rebuilt and filled with new sand. Cart paths have been rebuilt as have four bridges. 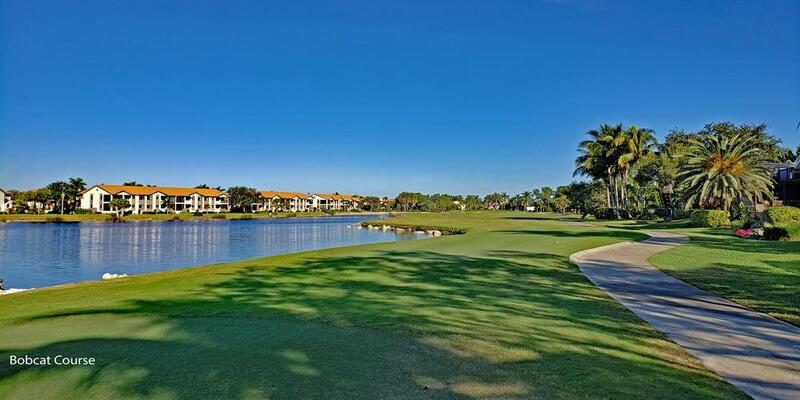 All of this has work has been done to ensure that The Forest Country Club stays at the forefront of private golf properties in the Fort Myers area. The Bobcat measures 6,607 yards from the longest tees with course rating of 72.2 and a slope rating of 128 on Bermuda grass. Not the longest course by any means, but don't let the length fool you; Bobcat will test even the best of players from the back tees. One of the most memorable holes on the Bobcat Course is Number 6. From the back tees, the hole plays 523 yards; it's a double dogleg the goes left and then right as directed by the water. Long ball hitters that can carry the lake on the left off the tee will have a great chance of getting home in two. The rest of us will play it as a three-shot hole. Your layup shot features water on either side of the fairway, although depending on your ball position you may be able to carry the water on the right. That will set up a short chip into the green which slopes gently from back left to front right. Par is a good score here. Golf holes don't have to be long to be challenging. Case in point: Numbers 10 and 14 on the Bobcat Course. They're similar; both feature water down the left side that fronts the green that will need to be carried on your approach shot. Hit smart tee shots and you'll be left with short pitches into the greens. Should you prefer racquet sports to golf, the Forest's Tennis Center has six expertly maintained Har-Tru courts, three of which are lit for night play. A variety of activities and programs are tailored to meet the needs of every player, regardless of ability. Tennis players come from all over the area to learn from Tennis Director Fred Kangwa. a former member of the Zambia, Africa Davis Cup team. The Forest has an active Women's and Men's Tennis Program and The Club is actively involved in the Lee County Women's and Men's leagues, Bonita Ladies League, and USTA team leagues. As for pickleball, it's one of the fastest growing sports in the nation and The Forest's pickleball program includes open play, clinics and leagues on four courts. In addition, there's a functional fitness area with two dual adjustable pulley systems, free weights, benches, stability balls, TRX trainers, resistance tubing and more to provide an endless variety of workout options designed to enhance your golf or tennis game. For those who prefer to exercise outdoors, there are classes at the "Fitness Garden" as well as walking and cycling groups. Whether its sport specific or a general wellness program, The Forest's fitness and health staff can assist you in reaching your goals. The Club's Formal Dining Room can accommodate up to 300 Members and their guests. The rectangular bar will seat 32 and the rooms can be sectioned off for smaller events. This new open concept will allow conversation and company to flow freely from the dining room to the member's lounge, located just past the lobby. The kitchen has also been redesigned and will feature new state-of-the-art equipment. The fitness center and aerobics room have also undergone a transformation and will have expanded views of the golf course. The new clubhouse will be the perfect place for a wedding or special event. Members can enjoy spacious private dining rooms that are perfect for a wide range of celebrations, charitable galas or business meetings. With spectacular views of both Championship golf courses, Members and their guests will delight in The Club's dining venues while enjoying magnificent Southwest Florida sunsets. Their Executive Chef and Special Events team will work together with you to ensure your guests have the experience of a lifetime! Members from Fort Myers, Fort Myers Beach, Sanibel, Naples, Bonita Springs and Cape Coral call The Forest their home club. Currently, The Forest has about 500 Members; that's not a lot of golfers for a 36-hole complex. Consequently, preferred tee times are not hard to come by. Neither is finding a game. There's a weekly calendar of events for men, women and couples, allowing you to renew old friendships or start making new ones. Or both! With everything going on at the Club, The Forest is looking for new Members who want to enjoy all of the benefits The Club has to offer. Whether you are an avid golfer, a lover of racquet sports, or a social butterfly, there is a place for you at The Forest. You'll find a vast array of amenities and a Membership category designed to fit your needs. The Forest offers a number of Membership plans, everything from a Preview Membership to Individual, Family and Executive Golf Memberships to Sports, Tennis and Social Membership. During this renovation period, The Forest is offering $5,000 off the joining fee.